One morning you decided to take out your vehicle that you haven’t used for a couple of days. You packed your stuff load it in your car turn the keys and nothing happens. You do this a few more times and still nothing. This is when you realize that your car battery is almost dead and does not contain enough charge to start your vehicle. Now only if you had a battery charger in your garage then you will not have faced such a problem but even a battery charger will not be able to start your vehicle from a nearly dead battery. 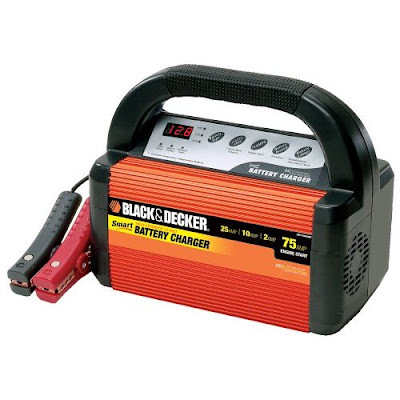 Not all except the Black and Decker smart battery charger has an amazing 75 AMPS jump start capability that will start almost any vehicle that has 12 V lead acid battery and does not start by its own battery. This Black and Decker charger is fully automatic when it comes to charging a battery. You just have to clamp the cables on to the battery terminals, select the charging rate and that’s it. It is a smart charger and will stop charging immediately when the battery has fully charged. This will be indicated on it LCD display. Plus it will also display how much current it is using to charge the battery and will also indicate any faults using the same LCD. The 25 Amps charge setting is ideal for charging a dead battery in less than 2 hours. If you are not in a hurry then you can leave the battery over night at 10 amps rating. If you plan not to use your car from a few days to a couple of weeks then it is best to take out the battery and connect it with the charger and use the 2 amps tickle charging feature. This setting will ensure that the battery maintain its charge as long as it is connected to the charger. Not to mention that the 75 Amps engine start feature is a real man for emergency vehicle start ups. Technically speaking it is a battery charger that no only charges car batteries. In fact it has the ability to charge any 12V lead acid battery of RVs, lawn movers, ATVs, boats and many more. This shows how useful this 3 pounds charger can be and is a must have garage item. Unlike others this charger is very light weight as it is not comprised of a heavy transformer instead it is equipped with a small transformer along with the rest of the electronics circuitry which makes this tool even more light weight and easy to move inside your garage. If battery charger is connected to the wrong terminals of a battery, it could result in damage to both the battery and the charger and in the worst case it can even harm the person standing close. But this is not the case with this battery charger as it has built in reverse hook-up as well as spark resistant protection which will not only indicate a fault status on its LCD display but will only begin charging the battery once its smart sensing technology assures that the battery has been properly connected. Its automatic float mode monitoring also makes sure that the battery is not over charged and is immediately cut off (internally by displaying a FULL signal) from the charger. Having all the above features plus the emergency jump start ability, this charger convinced me to place an order immediately as it is a must have garage battery charger specially if you have to deal with batteries or you do not drive on a regular basis. Thanks for the link. Unfortunately my ISP has currently blocked access to YouTube. I will have a look at the video as soon as the access has been restored.